BodyCombat is a mixed martial arts inspired workout. That is, besides general strength and core training, most of the exercise consists of strikes, hits and kicks from various martial arts. With guard at chin, lead foot faces target and rear foot a shoulder width apart at 45 degrees. Chest and hips align and face forward, not side on. Body weight is centred with a slight lean forward. Abs are braced and knees are soft. Boxing: Back heel off the floor and body weight 70% on front leg and 30% on back leg. Tae Kwon Do: Slightly wider stance on toes with bent knees. Face the front with body square on, feet with toes facing forward, wider than shoulders and knees soft and aligned with toes. Brace abs and lift chest bringing the weight to centre. Always with a guard specific to the choreography. Weight is 100% on rear leg. This is for strength, balance, and protection. A defensive action that involves pushing the opposing fighter’s fist by hitting it, or moving inside the offensive arm to turn it away from its target. Initiated by moving the hips back and bending the knees and hips to lower the torso to varying depths. Knees must be aligned with or behind toes. Hands are often crossed at the wrist in front of chest. A kind of assisted one-legged squat where one leg is brought behind, with the front lower leg perpendicular and the thigh parallel to the floor. From Combat or front stance, rotate the torso to bring the shoulder forward, punch lead hand from guard forward in a straight line rotating the wrist and turning the elbow out as the arms extends, keeping the elbow soft (not locked). As you punch, push weight from the back foot and onto the front foot by lifting the back heel. Return fist to guard. Non punching hand remains at guard. The target is the nose, lips, chin or – for low jabs – stomach of your opponent which are struck with the first two knuckles of the fist. As always, braising the abs improve force and control. Do not fling the punch by throwing the wrist or hand or punching from the elbow. Always punch from the shoulder. 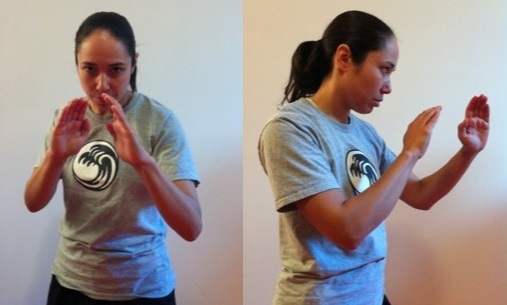 Do not over-extend the arm or lock the elbow, and remember to rotate the fist. In boxing guard lift elbow at max 90 degrees to shoulder height transferring weight to opposite leg and from combat or front stance, rotate hip, torso, chest and shoulder into the punch releasing the heel of striking side. Brace the abs and engage obliques striking the jaw of your opponent aiming 5cm past the target with the first 2 knuckles of the hand, palm down, retracting same path back to guard. Non punching hand remains at guard.